Last Wednesday, Canada lost its “national troubadour”, an “icon”, and “one of [its] most prolific and well-known country and folk singers”; a man who ranked 13th in CBC’s The Greatest Canadian list. Stompin’ Tom Connors is credited with writing three hundred songs, many of which are loudly and proudly Canadian. Upon his death, online tributes poured in from the CBC, politicians of all stripes, and even Sir Wilfrid Laurier’s fake Twitter account. NDP Members of Parliament paid tribute to Stompin’ Tom outside the House of Commons with their rendition of “Bud the Spud”. The Globe and Mail suggested that the mainstream media “patronized him as a novelty singer” and questioned whether he was given enough attention during his life. Everyone seemed to have a different story of their experience with Stompin’ Tom, but they were all general positive and “pro-Canadian”. Let me tell you my Stompin’ Tom story: I grew up in a non-musical family. My earliest experience of his music was when I was twenty, in a second-year Canadian history course, where Big Joe Mufferaw and the NFB’s Log Drivers’ Waltz were used as part of lessons on logging. The lens that I was given to look at him through was one of myth and memory, and the building of nationhood. I never made an emotional connection with his music, and in his death my recollection of his life’s work is maybe, therefore, more easily critical in nature. John Doyle wrote a piece in The Globe and Mail, “How Stompin’ Tom made me a true Canadian.” Doyle is far from alone in giving credit to Stompin’ Tom for building a Canadian identity. The McGraw-Hill textbook, Understanding Nationalism, geared towards grade 11 social studies students in Alberta, references Connors as an “individual who promotes national identity” by drawing on national myths for inspiration in his work. It refers to “The Hockey Song” as a non-official national anthem of Canada. There are a few things that struck me about the way that Canadians talk about this national icon in his death. For starters, while his catalogue is staunchly Canadian in its content, it is also very regionalist. Those in Eastern Ontario remembered him for “Big Joe Mufferaw” – based on the story of Joe Montferrand, a logger in the Ottawa Valley – while “The Ketchup Song” is an ode to the town of Leamington, Ontario, and ‘Bud the Spud” accounts the tale of a trucker hauling potatoes from PEI. It’s also interesting to look at how, within these regionalisms, there is a focus on the resource economies within them. Canada’s people rely on their farms and forests. Tobacco fields, tomato greenhouses, potato farms, logging. This is what Canadians know about their environmental history from Tom Connors. Connors also wrote about both well-known and little-known episodes of Canadian history, including the myth of Joe Montferrand. He wrote about the Black Donnellys, about pilot Wilfrid “Wop” May, about the collapse of the Ironworkers Memorial Bridge in Vancouver, the Hollinger Mines fire in Timmins, the Reesor Siding Strike of 1963, and the Algoma Central Railway. Lesser known, and without parallel elsewhere in his catalogue was “The Blue Berets”, his song about Canadians’ role as peacekeepers. General Romeo Dallaire wrote that he played this song during the bombardment of his headquarters in Rwanda in 1994. And we’ll think no more of Inco on a Sudbury Saturday night. One of his best-known songs featuring a female protagonist, “A Real Canadian Girl” describes an ideal Canadian woman who is depicted as having the best of the nation’s traits. She is from “Miramichi by the old Atlantic sea”, an “all Acadian, northern lady” who enjoys hockey and curling and is “fond of the great outdoors.” On the one hand, it shows how Canadian identity is an amalgam of symbols and regionalisms. On the other hand, part of its popularity is that it reads a bit like Molson’s “I am Canadian” commercial, by listing off a collection of things that we have somehow collectively decided belong to us. Not only is more Canadiana not “more better”, but I would put forward the argument that identity is not a magic pill that can be swallowed as a capsule, through which we automatically make ourselves better as a nation. While bite-sized stories are useful as a hook to take us into understanding ours pasts and ourselves , we need to – as a country – be able to think critically about our myths. I would not necessarily argue that Connors’ catalogue was an overly-simplistic illustration of Canadian identity (though some individual pieces are), but the collective memory of his music, in light of his death, lacks any serious reflection. You can better serve your country, by living somewhere else. Unsurprisingly, he took issue with sharing those stories beyond the geographic borders of this imagined nation and was a protectionist of Canadian culture. In 1978, he was awarded six Junos. He famously returned them in protest of the Canadian artists who resided and conducted most of their business in the states. While I don’t agree with Stompin’ Tom’s ideas about nationhood, there is little question that he successfully made a life’s work of it. What remains to be seen is whether his music and its symbolism will stand the test of time in his passing. Kaitlin Wainwright is a graduate of Carleton University’s Public History program. She’s currently the Plaques and Markers Program Coordinator at Heritage Toronto. I think you’re expecting more of Stompin Tom than can be delivered in a 3 minute song. Considering that many of our professional historians write regional history for the most part, Connors’ regionalism in his compositions is not surprising. It’s the nature of history in Canada. As for his focus on resource economies, those resource-based economies are the reality and identity of the regions of Canada about which he wrote. Is Canada more complex than that? Sure. But singers have to pack that complexity into a verse or a lyric. For example, the words “inco” in Connors’ lyrics and “Richardson ground squirrel” in Corb Lund’s have as much regional meaning to listeners as an article on either subject. Jane, I think we’re in agreement on this, actually. I think Stompin’ Tom reflected much of the realities that Canadians face – though maybe simplified because of the nature of the medium. What surprised me was the reaction of the public and mainstream media following his passing – that they condensed him into a hero troubadour of Canadian national anthems, rather than reflecting on the vast landscape of regionalisms in his body of work. I find the critique of ‘regionalism’ odd. Any cultural expression which goes beyond the central elite of a country, pretty much by definition will have ‘regional’ content. Ask a Catalan or a ‘Geordie’ or a Bavarian or – well you get the picture. The only way an artist – in any medium, could avoid your critique is to operate at a level of abstraction which is removed from the daily experience of ordinary people. I learned ‘Sudbury Saturday Night’ drinking in the union hall in Thompson, Manitoba and working at the Inco Mine there. His songs reflected the dominance of resource industries in Canada when his views and experiences were being formed. But surely Red River Jane could have been set in Vancouver or Edmonton or Toronto. I have ideological problems with Stompin’ Tom’s nationalism. I don’t like or trust any nationalism. But I have no problems whatsoever with his artistic voicing of the lives of people like me. He and Lighfoot wrote about the world I lived in and did it wonderfully. And if this slips into a bit of romaticizing of Stompin’ Tom on his death – just fine with me. In a few years we will wrote about him as part of our intellectual history. I have no interest in doing that this week – or next. Dave – having lived in the Rhineland I am familiar with regionalisms. I can remember being told in Berlin that “man spricht hier mal Deutsch” (people here speak German) because my German wasn’t ‘high-German’. 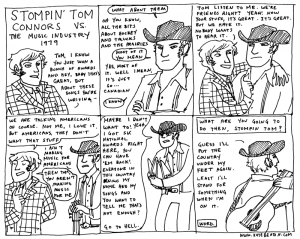 It’s not Stompin’ Tom’s regionalism that I’m after but its absence in tributes to him. 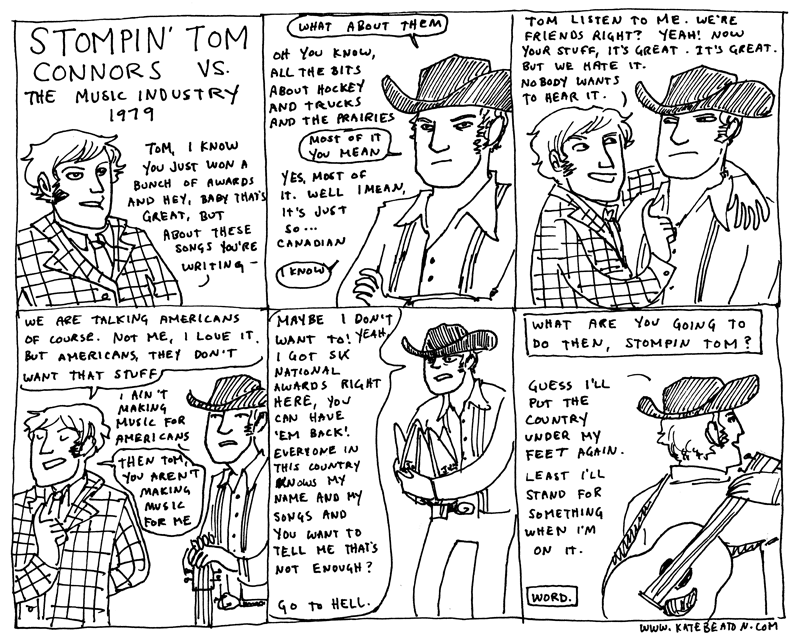 I think the point is that there has been no debate within the mainstream media about the legacy of Stompin’ Tom. The panegyrics say that he was a true Canadian, not just a model for all Canadians, but a definer of what it means to be Canadian, and that this is unreservedly a positive thing. Surely there is room to question both Stompin’ Tom’s world view as well as his version of Canadian identity. As for the idea that it’s asking too much of a three minute song, Gordon Lightfoot and Bruce Springsteen have both managed to tap into a similar zeitgeist without sacrificing nuance or social commentary. Kaitlin – I think our regionalism is a significant part of the national consciousness, although usually not expressed in that way. For example, grad school history content was quite different in southern Ontario than in southern Saskatchewan! Andrew: Of course there is room to discuss and question and debate anything and everything. But I think you will find as many Canadians that want to do that to mark Stompin Tom’s death as you will folks who go the Uncle Rob’s funeral to discuss the nuance of the gender roles in his relationship with Aunt Alice. And I suspect neither Kaitlin and Andrew got a lot of pleasure from Stompin Tom’s music or could relate to much of his subject matter. That reaction to any art is always a mix of generation, gender, class and culture. Nothing wrong with it at all. But for those who were moved by his music, our first reaction to his death is not to do an intellectual cost benefit analysis. Culture should be analyzed that way – just not at the funeral. Now if you found his role reactionary or harmful and want to attack his positive portrayal – that indeed should be done right now. But that is not what anyone here has claimed as their goal. The rest can, as I said in my original post, wait a few years. Andrew: I suspect you’re not a fan of the genre. I don’t recall Lightfoot or Springsteen tapping into the bingo culture, for example. They’re social observers (and very good ones), but Stompin Tom’s lyrics were those of someone who lived those lives (whether or not that is a fact). That is what resonates with his listeners. I wonder if Stompin’ Tom left with a heavy heart seeing the influx of Hindus, Muslims and Africans who come here with no intention of being Canadian or learning about Canada. Who don’t even bother to learn the language. grace petersen: Don’t try and bolster your racist sentiments by suggesting a dead person might support them. Wow, Grace. The same could be said of our ancestors (and was). Grace – Stompin Tom sang a lot about the ethnic mix of the people he met traveling and working across Canada. And apart from using some slang terms that were common in his generation, never did I hear him put people down for which part of the world they immigrated from or which religion they practice. So I don’t wonder at all about Tom. I agree with Jim. This is your bigotry – not his.